It's the first day of fall in Seattle (well, I guess all over the Northern Hemisphere it is too)… and it is 83 degrees outside. Have I mentioned that sometimes Seattle weather drives me nuts? We get summer weather in the fall and… rain every other time? Whatever, I still love you Seattle and no matter what you do I'm still not budging. That and I really like my apartment. I have a pretty view and a pretty rocking convection oven. As peach season was, and almost still is, in full swing in Washington, my CSA box was loaded with the fuzzy fruit. So much so that I really couldn't eat it all by myself. I churned it into ice cream, baked it into batter and dutifully snacked on slices throughout the day. Still, I had a few left over and and BAM, birthday cupcakes! When my dear friend, Katrina, turned 24 a few weeks ago we went out to The Saint, a new-ish tequila bar in Capitol Hill. Now if bringing your ergonomic cupcake carrier to the bar doesn't scream "coolest person alive," I don't know what will. Per usual, I topped the cupcake off with my (now) signature goat milk buttercream but I could have never anticipated how well the flavors would mesh together. Sweet n' tangy. It's kinda my thing. It was apparently everyone else's thing too. 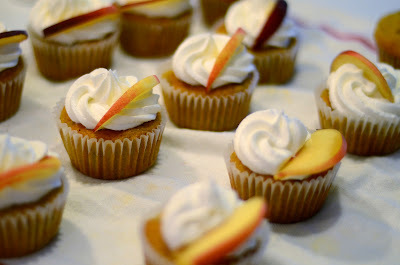 I'm not usually one to toot my own horn, but most, if not all, of my friends said "these [were] the best cupcakes I have ever had!" The cupcake is light like a muffin but slightly denser like cake. Of course, having pockets of peaches scattered throughout the batter doesn't hurt either. Preheat the oven to 350°F. Line 28 muffin cups with paper liners. Sift together the flour, baking powder, baking soda, salt and nutmeg and set aside. Cream the vegan butter and sugars together, beating until fluffy. Add the eggs, one at a time, scraping down the sides and bottom of the bowl between each addition, and then the vanilla. Gently mix in the almond milk/vinegar mixture Stir in the dry ingredients and fold in the peach chunks. Divide the batter evenly among the prepared cupcake liners. Bake for 18 to 22 minutes, or until a tester inserted into the center of cupcakes comes out clean. Cool the cupcakes for five minutes in the tin, then turn them out onto a wire rack to cool completely. Beat goat butter until fluffy. Slowly beat in powdered sugar a few tablespoons at a time. You may add some vanilla extract but you will lose the pure color coloring and honestly, this buttercream doesn't need it. It tastes like goat cheese! 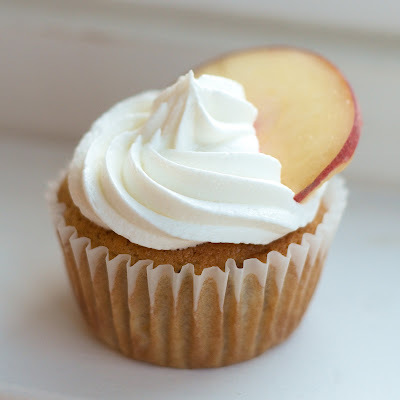 Jessica - you've never seen a peach cupcake before?! They're so delicious!